Our mornings begin with camper-directed exploration. They are invited to investigate an area of our space in a way that feels comfortable for their start to the day. Campers will find art materials, natural building objects, books, open-ended experiments, and free spaces to roam. Once everyone has arrived we take time to circle up and check in with one another. With only a week to get to know some new people, we strive to make community building an important part of our day. Snack rounds out the first part of our morning and gives us a boost of energy to play field games before the day gets too hot. Next up is an educator-lead activity that is driven by the theme of the week. 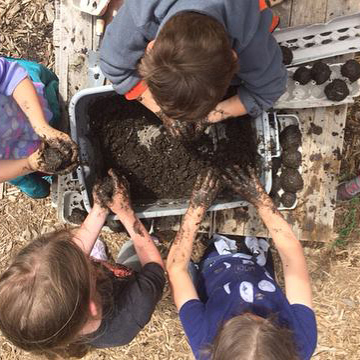 Our pre-lunch activity may be the set up for a longer experiment, planting or harvesting, building a fort, or checking out macroinvertebrates mucking about in nearby Johnson Creek. During lunch we eat while we rest! Educators read aloud from our chapter book while campers feast on their lunches. After lunch comes siesta, where we give everyone permission to explore, take appropriate risks, and make their own choices, to build autonomy and create friendships. We slowly transition back into educator-lead activities. The day rounds out with an afternoon snack and a closing circle where we share our Rose, Bud, and Thorn (the part of the day we liked the most, what we are looking forward to in the future, and what wasn’t our favorite or what we want to try to do differently next time). ECO’s goal is to create a safe space for children to run, play, experiment, and discover the ecological wonders that are here in our city. We want to connect the dots to demonstrate how we can positively interact with and impact our natural environments while having a memorable camp experience. Your camper will need a refillable water bottle. We drink a lot of water throughout the day to stay hydrated and refill often. While we sometimes snack on what is available on the farm, it is important to have everyone getting the appropriate amount of calories to build healthy energy. Please pack 2 protein rich snacks and a lunch with plenty of ice packs. We run a lot, we jump in puddles, we might even climb a tree so make sure your camper wears shoes with a heel strap. It is recommended that you bring an extra pair of socks, pants, and a shirt. Don’t forget to check the weather report in case you need to bring a raincoat or sweatshirt. Please note that your camper must be entering kindergarten or older. They must be able to use the bathroom on their own and be able articulate when they need to use the toilet. Campers must be comfortable being outside for the entire day and be able to stay awake between 9:00 AM and 4:00 PM. Please leave all lovies, stuffies, and other toys at home. We are outside all day and there is risk involved. All guardians will be required to sign a waiver of liability and consent before the first day of camp.